The Keratosis Pilaris Photograph(s) are © copyright protected. Unauthorized use is prohibited. Keratosis pilaris is an extremely common condition. It affects somewhere between 25 and 50% of all people to some degree. It presents as small, rough, pink to red bumps. The most common locations include the back of the arms, thighs, and cheeks. It usually presents in childhood. It may be associated with atopic dermatitis. 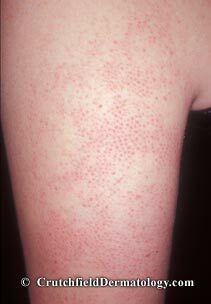 Keratosis pilaris may be exacerbated by certain conditions such as pregnancy. Although the clinical presentation (appearance and location) of keratosis pilaris is strongly suggestive of the diagnosis, in certain circumstances, a skin biopsy may be required to differentiate it from folliculitis or acne. The cause of the keratosis pilaris is unknown. There is a strong genetic basis and patients with keratosis pilaris may see similar lesions in other family members. Keratosis pilaris is a chronic condition, meaning it will last for a lifetime, although at many times its appearance may be minimal. Because it is so common, some dermatologists consider it to be a normal skin variant. As you can imagine, it can be extremely difficult to treat something that is “normal.” Nevertheless, topical treatment can be used to minimize the appearance of keratosis pilaris. Dry skin can worsen the condition. In certain circumstances keratosis pilaris can be very itchy and/or painful. In these circumstances, there are many treatment options available. These include over-the-counter preparations (Glytone keratosis pilaris treatment kit), prescriptionength topical medications, microdermabrasion, ultraviolet light treatment, and laser treatment. Dr. Crutchfield will carefully evaluate your condition and recommend the best treatment program for you.